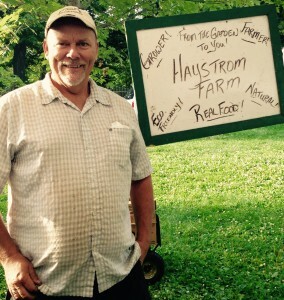 During last week’s market, I had the pleasure of having a chat with Jim Hayward from Haystrom Farm to ask him a few questions. 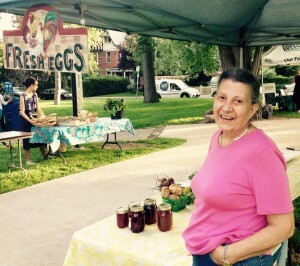 He travels all the way from Picton each Tuesday to be with us in Cabbagetown, and is a very valued member of the market. Michelle: Hi Jim! What would you say has been the greatest lesson you’ve learned in your work? Jim: Mother nature can be very fickle. Very true. Michelle: I can imagine. And what do you look forward to most in your work? Jim: I’d say the rewards of providing good quality product to the customers. Seeing their happy faces with what I provide for them. Michelle: That’s great. What is your favourite aspect of selling at farmers markets? Jim: Just meeting different people from all walks of life- different ethnicities and a large diversity of people. Michelle: That is a really fun part of the market, definitely! What is it about Cabbagetown specifically that you like the most? Jim: It is very diverse, and it has a great atmosphere with very positive energy and friendly people. Michelle: And what’s your favourite Ontario produce? How do you like to eat it? Or do you have a favourite recipe? Michelle: Of course- you’re known as the tomato guy! And how do you like to eat them? Jim: When they first start to ripen in the field, just eat it like an apple- still warm from the sun. Michelle: That would be amazing. Just raw and fresh. Michelle: Well thanks so much Jim. It was great chatting with you! Trillium Organics Farm has also been a great part of the market, always having a large variety of fresh veggies. 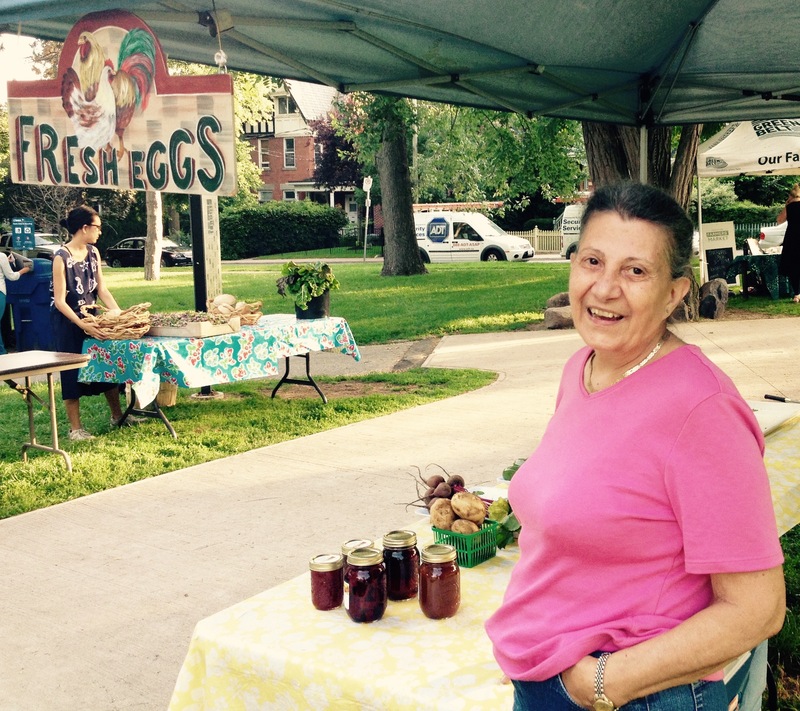 Chris Jurjans is a long-time Cabbagetown market vendor and is very happy to be back. Michelle: So Chris, what has been the greatest lesson you’ve learned in your work? Chris: Tell people the truth! Oh gosh – it always pays to tell the truth. Because if you don’t tell them the truth about your produce, where it comes from, if you’re organic or not, always tell them. Sooner or later you’re going to lose your customers. Michelle: They need to trust you in order to keep coming back. I agree, that’s really important. Michelle: And what do you look forward to in your work? Chris: The market! Coming to the market. I’m lucky, I really am. The people at my markets are so nice and have stuck with me from the beginning. They order summer and winter. I look forward to the markets each week the most. Michelle: That’s great. Interacting with the people is really rewarding. Chris: I also really enjoy educating people about food. Some people just don’t know what some vegetables are or what to do with them – like eating the greens from the beets, or how to cook okra. Michelle: That’s a great thing about markets! Learning about new vegetables and new ways to use them. What do you like about the Cabbagetown community specifically? Chris: The people, definitely the people. Michelle: Yes, just the friendly, positive vibes? Chris: Yes, very nice people. Michelle: So what is your favourite Ontario produce and how do you like to eat it? Chris: I love my eggs. Oh boy do I ever like my eggs. I can eat them any way. They are different, and I can’t eat any others. But my hubby is the bigger cook. Michelle: That’s great Chris, thank you so much for the chat!